BILLY WRIGHT sprinkled glamour on to a nation desperate to throw off post-war austerity. He married a Beverley Sister, the Spice Girls of his generation, and played at Wolverhampton Wanderers, where they made the first great experiment in European football, under floodlights. BOBBY MOORE represented the cool of the sixties. As happy mixing with movie stars as the general public, Moore was a man of the people, an East End lad made good. The image of him walking from the players’ exit at Upton Park and tossing a set of keys to a group of boys to unlock his Jaguar sums up his approach to life. Long after he had retired, BOBBY CHARLTON was the single English name most recognised abroad and remains the top scorer for his country. He is still regarded as the finest player ever to pull on an England shirt and was pivotal to Alf Ramsey's plans for success in '66. PETER SHILTON kept goal in two of English football’s pivotal moments, the defeat by Poland in 1973 and the World Cup semi-final with West Germany 17 years later. He summed up a generation of footballers who liked a pint and a bet but who would give everything for a shirt with Three Lions on it. He is regarded as perhaps England's greatest 'keeper. DAVID BECKHAM represents the present celebrity age, completing the circle from the Billy Wright era. But it emphasised how the game had changed. Footballers never earned big money in Wright’s era thanks to the maximum wage, whereas the multi millions put Beckham into a financial class of his own. The Fab Five could soon to be expanded to eight as Ashley Cole, Steven Gerrard and Frank Lampard approach their respective tons. 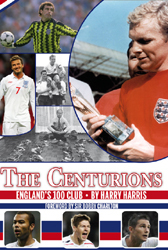 Harry Harris tells the tale of each of the England centurions and with it the era he played in from the 1950s and England's emergence from post-war gloom, through the glory of '66 to the present day trials and tribulations of a national team seemingly never far from controversy. Harry Harris has won a total of 14 journalism awards. A regular analyst on football related matters on all major TV news and sports channels, he has appeared on Richard & Judy, Newsnight, BBC News, ITN News at Ten, Sky and Setanta. He is also a regular on Radio 5 Live, Radio 4, and TalkSport. He has been interviewed on Football Focus and appeared on the original Hold The Back Page and Jimmy Hill's Sunday Supplement on Sky. Arguably the most prolific writer of best selling football books of his generation, Harry has penned 66 titles including the acclaimed best seller Pele - His Life and Times and George Best’s last book, ‘Hard Tackles and Dirty Baths’. Harry has written one of the most influential football columns in the country for three decades and is regarded as one of the best investigative journalists and perhaps the best news gather of his generation. He has worked for the Daily Mail, Daily Mirror, Daily Express, Daily Star and Sunday Express and has nearly 30 years experience as the country’s number one football writer. Harry is now Football Correspondent for ESPN Soccernet.